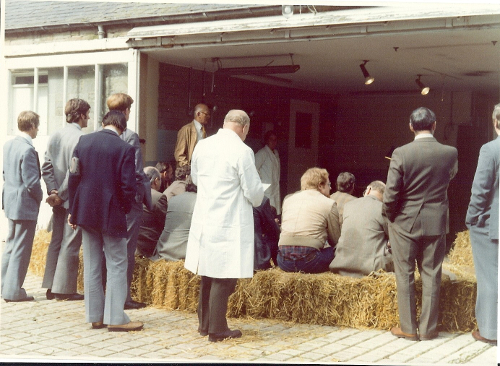 In 1976 I participated in a very successful visit by the Sheep Veterinary Society to the Republic of Ireland. Other participants included Terry Boundy, Michael Clarkson, Andrew Madel, Bob Beck, Hector Calder, David Buntain, Gethin Rees and Ogilvie Mathieson. Our guide was an Irish Veterinary surgeon called Pat Daly who entertained us with a fund of anecdotes on the coach from Dublin to Cong in the West of Ireland. Our first stop on the way was at the Veterinary Laboratory in Athlone where we had talks on the main sheep diseases of the area from the resident veterinary surgeons, Walter McMicken and P J Dwyer. Continuing our journey Pat regaled us with a commentary on the conditions he had experienced during his time in general practice in Balinrobe and latterly with the local Government Department. When he mentioned that the most common of these was a condition he called HEFT the academics amongst us sat up and took notice with pencils poised to record this pearl of wisdom only to be brought back down to earth when they were told that the acronym stood for "hypo every ---- thing". HEFT subsequently found its way into a revised edition of Black's Veterinary Dictionary. During our time in Cong we visited the Experimental Hill Farm in Connemara and were entertained in the evenings by Bob Beck on the bagpipes whilst Gethin Rees led the singing. Stimulated by this experience it occurred to me that there was an opportunity to hold a comprehensive meeting on sheep diseases for veterinary surgeons and other key stakeholders. 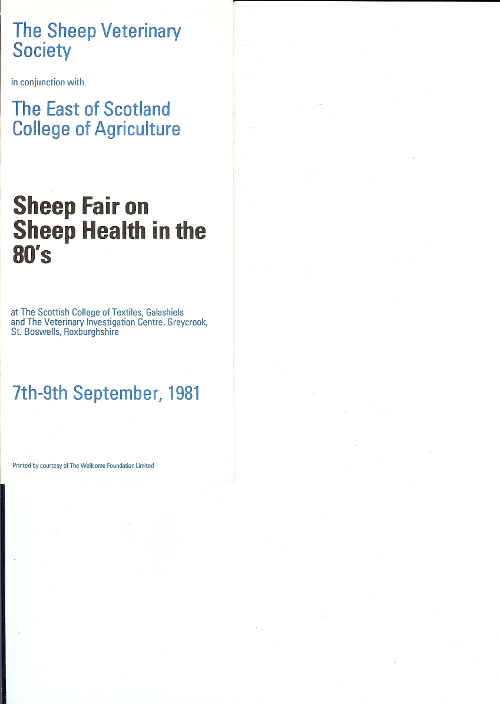 Therefore I persuaded the office bearers of the Sheep Veterinary Society (SVS) to join with me and my employers, the East of Scotland College of Agriculture (ESCA), in putting on such an event which I called a Sheep Fair. 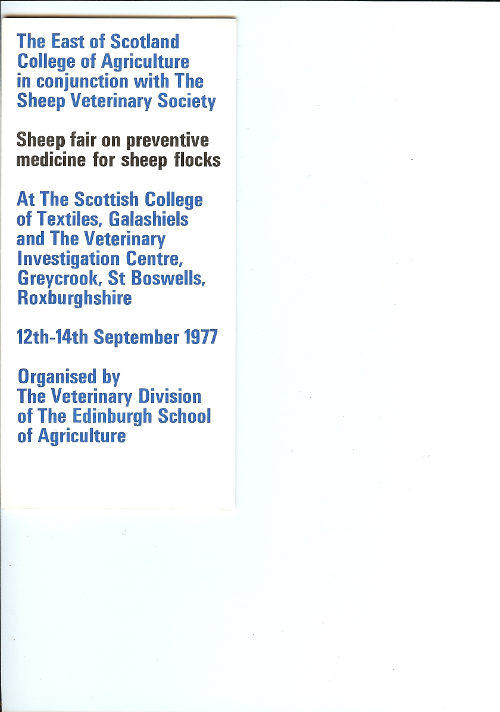 In September, l977 I organised the first one in the Scottish Borders at the Scottish College of Textiles, Galashiels and the St. Boswells Veterinary Investigation Centre on "Preventive Medicine in Sheep Flocks". 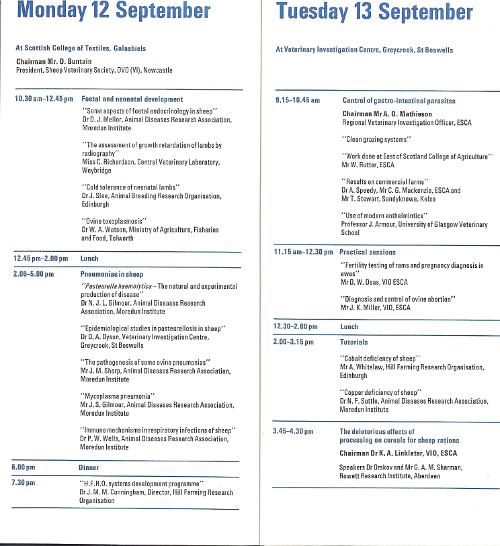 This was a three-day event and was organised in conjunction with the SVS. 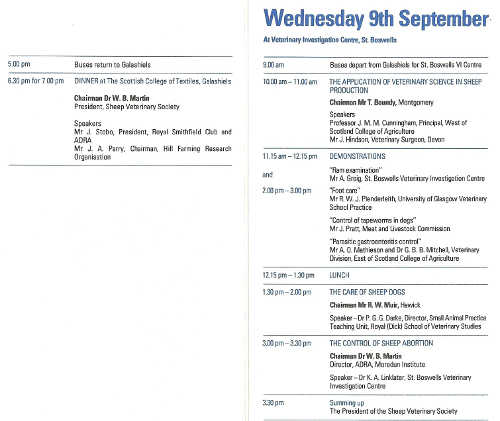 Accommodation was provided at the College and the programme on the first day took place there and was chaired by David Buntain, President of the SVS. Topics were aimed at research workers and subjects covered were in the broad categories of "Foetal and neonatal development" and "Pneumonias in sheep" with speakers from the Moredun Research Institute, the Animal Breeding Research Organisation, MAFF and ESCA. 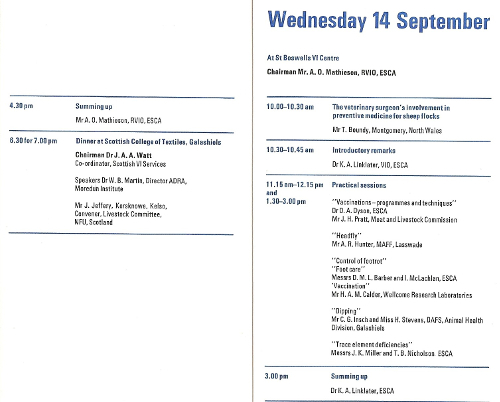 The programme on the second day took place in a marquee at the St Boswells VI Centre and was primarily for veterinary surgeons in practice. 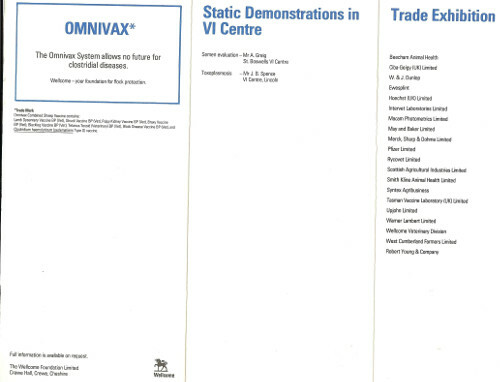 The sessions were chaired by Ogilvie Mathieson, Regional VIO, ESCA and consisted of a mixture of lectures and practical demonstrations. Topics covered included "Control of gastro-intestinal parasites", "Trace element deficiencies", "Fertility testing", "Abortion" and "Nutrition". 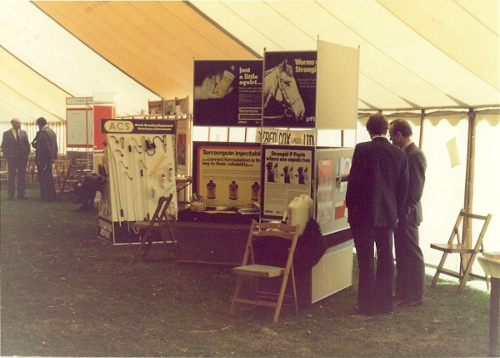 That on the final day was aimed at sheep farmers with again a mixture of lectures and practical demonstrations with live sheep. 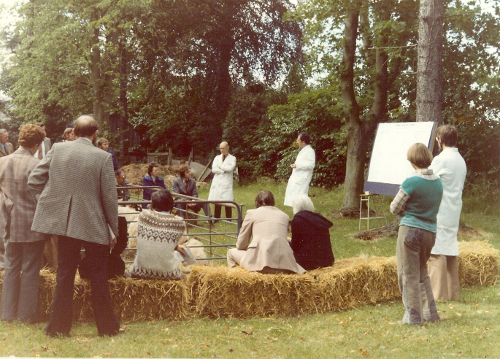 Terry Boundy set the ball rolling with a talk on "The veterinary surgeon's involvement in preventive medicine for sheep flocks". 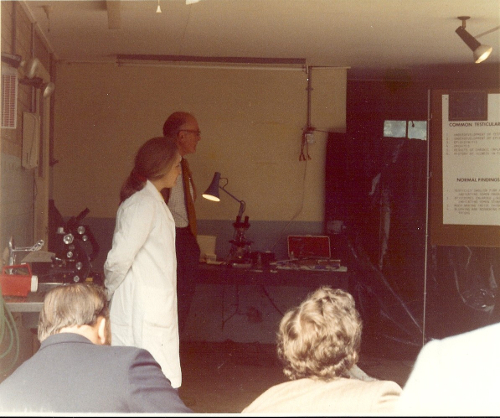 This was followed by a series of practical demonstrations on "Vaccinations", "Headfly", "Control of footrot", "Dipping" and "Trace element deficiencies". The conference dinner was chaired by Allan Watt, Co-ordinator of the Scottish VI Service and the after dinner speakers were Bill Martin, Director of MRI and James Jeffrey, Convenor of the Livestock Committee of the National Farmers' Union of Scotland. 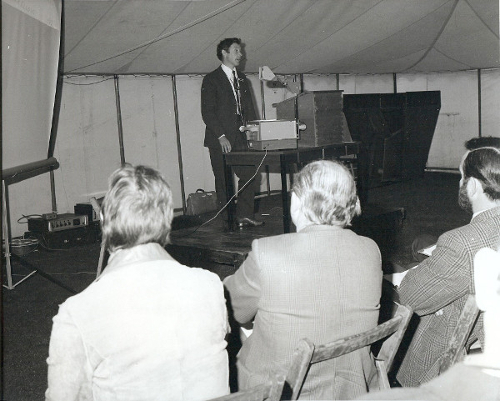 Upwards of two hundred delegates attended each day and these included research workers and veterinarians from as far afield as Shetland, Devon and Cornwall, Ireland and Holland. The event was supported by the generous sponsorship of sixteen commercial companies. 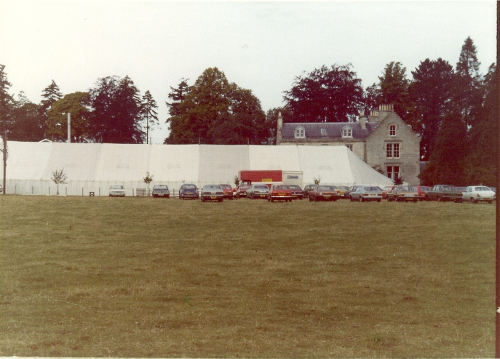 A second Sheep Fair was organised on the same lines in l98l again at the same venues. This time the SVS through the invaluable assistance of the Secretary, Andrew Madel, took an active role in the organisation. 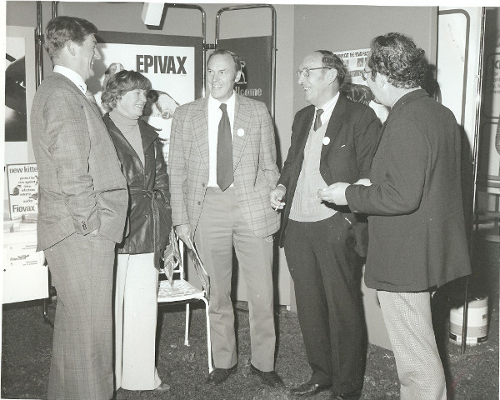 The theme was "Sheep Health in the 80's" and the first session under the chairmanship of the President of the SVS, Bill Martin, was held at the College of Textiles in Galashiels. 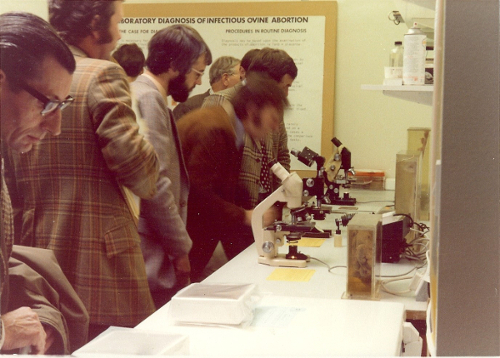 Topics covered included "Tick Borne Fever", "Vibriosis" and "Chlamydial Abortion". On the first afternoon a field visit to the Hill Farm Research Organisation's farm at Sourhope near the Scottish/English Border was organised. After introductory talks by the Director, Jock Eadie, and senior colleagues, delegates were conducted around the farm to observe the on-going experimental work which was very much aimed at solving practical problems. 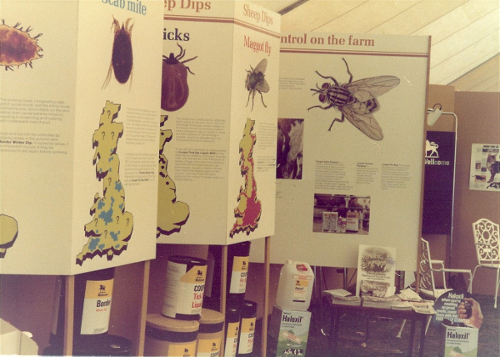 There was special interest in the "Two Pasture System" which was being developed and which had particular relevance for hill farmers throughout the UK. An appropriate farm visit like this became an integral part of future SVS meetings. The rest of the sessions were held at the St Boswells VI Centre. The morning programme on the second day was chaired by Ogilvie Mathieson, Regional VIO with ESCA and subjects covered included Border Disease, Broken Mouth and Nutrition with a final session on the use of computers in sheep practice. In the afternoon there was a series of live demonstrations on "Pregnancy Diagnosis", "Blindness in Border Collies", "Anaesthesia" and "Hypothermia in Lambs". The afternoon was rounded off by David West, President of the New Zealand Sheep and Beef Cattle Association who described "A Practical Approach to New Zealand Flock Problems". The conference dinner was chaired by Bill Martin and the after dinner speakers were Jim Stobo, President of the Smithfield Club and Chairman of the Animal Diseases Research Association and John Parry, Chairman of the Hill Farm Research Organisation and Past President of the British Veterinary Association and the Royal College of Veterinary Surgeons. 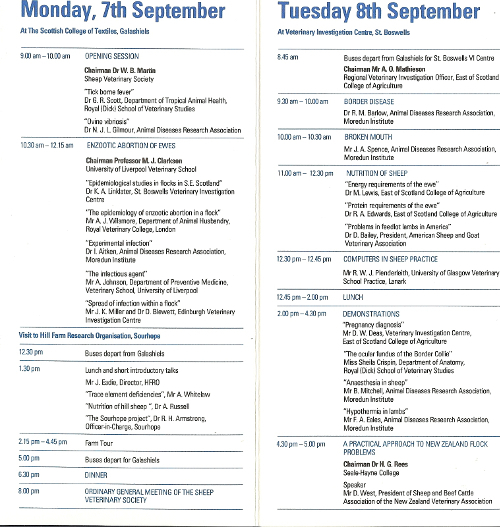 The programme on the third day was aimed at sheep farmers and the first session was chaired by Terry Boundy. Professor Ian Cunningham, Principal of the West of Scotland College of Agriculture and eminent SVS member from Devon, Jim Hindson, dealt with "The Application of Veterinary Science to Sheep Production". 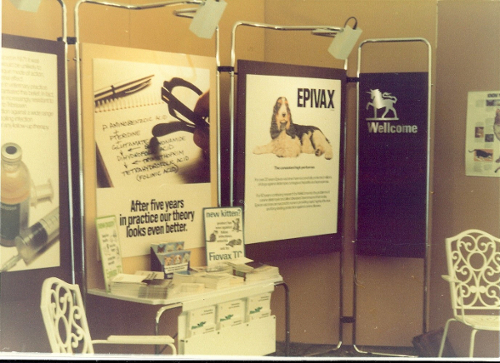 A series of practical demonstrations followed covering topics such as "Ram Examination", "Foot Care", "Control of Tapeworms in Dogs" and "Parasitic Gastroenteritis". Finally there were lectures on "The Care of Sheep Dogs" and "The Control of Sheep Abortion" and the conference concluded with a summing up by the President of the Sheep Veterinary Society, Bill Martin. Over two hundred attended on each of the first two days and the numbers were boosted by local farmers to over three hundred and fifty on the third day. 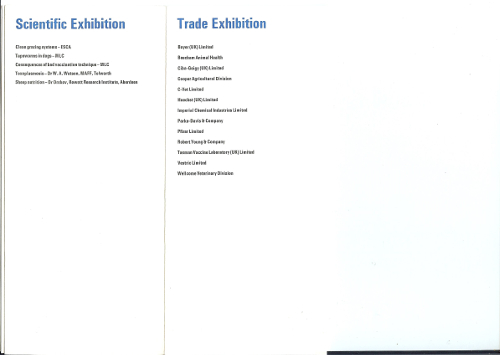 The Sheep Fair was supported by a commercial exhibition involving 20 companies. 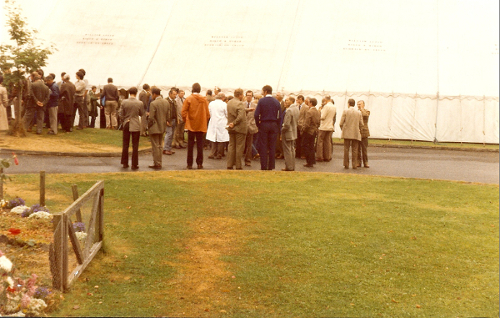 As well as those from the UK, delegates included a party of twelve American veterinarians brought over by Don Bailey, President of the American Sheep and Goat Veterinary Association, and others came from Canada, New Zealand, West Germany, Colombia, Ireland, Sweden, The Netherlands, Greece and Italy. 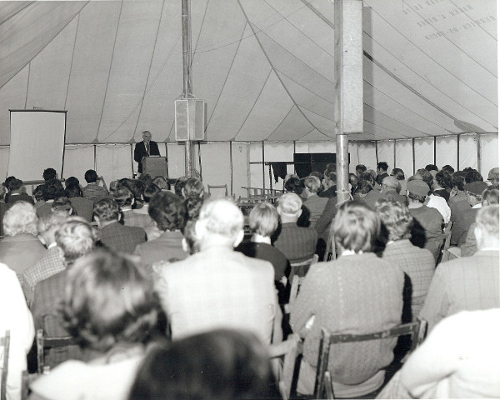 Because the event had outgrown the facilities at Galashiels and St Boswells and because of its obvious overseas appeal it was decided to make the next one an International Meeting and hold it at Heriot-Watt University in Edinburgh in l985. This coincided with the second of my Presidential years in the Sheep Veterinary Society which took over responsibility for the organisation. I was therefore this time ably assisted by Chris Lewis (Secretary) and Mike Prettejohn (Treasurer) with Neil Spedding as Vice President. 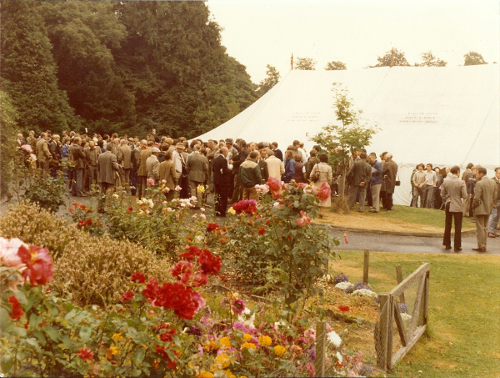 The Conference was opened by the Minister responsible for Agriculture in Scotland, Lord Gray of Contin, and attracted large numbers of overseas delegates as well as many from all parts of the UK. This time the programme was aimed solely at veterinary surgeons and research workers with an interest in conditions affecting sheep and the format was a series of lectures backed up with live demonstrations. 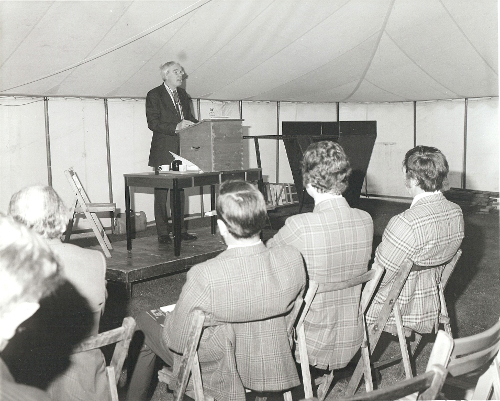 Karl A. Linklater, President of the Sheep Veterinary Society, 1983 – 85.